Bluefin Labs analyze 5 billion of online comments and 2.5 million minutes of TV every month. 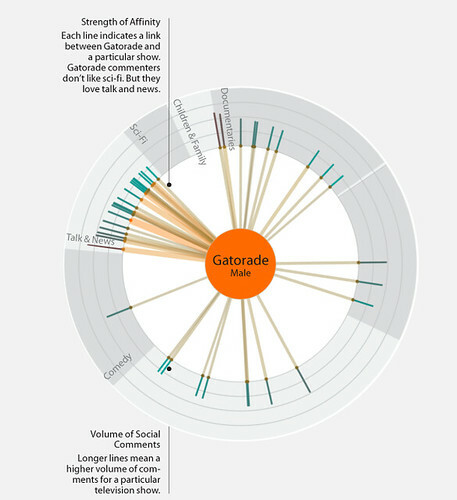 This visualization shows the relations between Gatorade brand and the male viewers of different TV shows. Source: Bluefin Mines Social Media To Improve TV Analytics, Fast Company, 11-07-2011. Echonest offer information on 30 million songs and 1.5 million music artists. 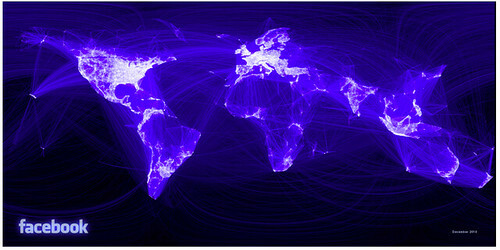 Paul Butler's visualization of a sample of 10 million friends from Facebook, using company' data warehouse. Source: Paul Butler, Visualizing Friendships. biology and physics. But the emergence of a data-driven 'computational social science' has been much slower. Leading journals in economics, sociology, and political science show little evidence of this field. But computational social science is occurring in Internet companies such as Google and Yahoo, and in government agencies such as the U.S. National Security Agency. Computational social science could become the exclusive domain of private companies and government agencies. Alternatively, there might emerge a privileged set of academic researchers presiding over private data from which they produce papers that cannot be critiqued or replicated. Neither scenario will serve the long-term public interest of accumulating, verifying, and disseminating knowledge." Contemporary media and web industries are dependent on the analysis of this data. This analysis enables search, recommendations, video fingerprinting, identification of trending topics, and other crucial functions of their services. Because of its scale and technical sophistication, perhaps we should call it "computational humanities." The players in computational humanities are Google, Facebook, YouTube, Bluefin labs, Echonest, and other companies which analyze social media signals (blogs, Twitter, etc.) and the content of media on social networks. They do not usually ask theoretical questions which can be directly related to humanities, but the types of analysis they perform and the techniques they use can be easily extended to ask these questions. The questions posed in the paragraph I quoted above are directly applicable to "computational humanities." We can ask: Will computational humanities remain the exclusive domain of private companies and government agencies? Will we see a privileged set of academic researchers presiding over private data from which they produce computational humanities papers that cannot be critiqued or replicated? "The idea behind the Digging into Data Challenge is to address how "big data" changes the research landscape for the humanities and social sciences. Now that we have massive databases of materials used by scholars in the humanities and social sciences -- ranging from digitized books, newspapers, and music to transactional data like web searches, sensor data or cell phone records -- what new, computationally-based research methods might we apply?" In our lab, we are hoping to make a contribution towards bridging the gap between "digital humanities" and "computational humanities." Our data sets range from the small historical datasets - for instance, 7000 year-old stone arrow heads and paintings of Piet Mondrian and Mark Rothko - to large scale contemporary user-generated content such as 1,000,000 manga pages or 1,000,000 images from deviantArt (the most popular social network for user-generated art). We also write papers for both humanities and computer science audiences. All our work is collaborative, involving students in digital art, media art, and computer science. And although our largest image sets are still tiny in comparison to the data analyzed by the companies I mentioned above, they are much bigger than what humanists and social scientists usually work with. The new visualization tools we have developed already allow you to explore patterns across 1,000,000 images, and we are gradually scaling them up.